On Sunday we went to our first hypnobirthing session. I first heard about hypnobirthing a few years ago when a friend said she had done classes and it really helped her through her first birth experience. Anything that can help with birth sounds good to me so of course I got it into my head that when my time came, I’d find out more about this hypnobirthing malarkey. At around New Year hubby and I committed to NCT classes and, given our change in finances, I reluctantly accepted that we probably wouldn’t be able to afford to do hypnobirthing classes as well. So I bought a book about hypnobirthing, which, predictably, I read the first chapter of and then somehow just didn’t find time to pick up again. Fast forward to us actually starting NCT classes, and other couples started talking about how they’d done hypnobirthing classes too and found them really helpful. Well, thank goodness for a bit of peer influence, because I think up until this point hubby had thought that hypnobirthing was all a load of hippy nonsense and not something to be spending his hard earned cash on. I think the opinions of the NCT bunch, coupled with a growing realisation from him that an actual child is going to have to exit my body at some point and I could be a bit worried about it, convinced him that hypnobirthing might be worth a try. When we went to the Mothercare Expectant Parent event a few weeks ago, we met a lovely lady who was selling the services of her mum; a midwife at our local MLBU and hypnobirthing practitioner. Her course also happened to be £40 cheaper than the main provider in our area, so we were pretty much sold! The only worry I had was that the optimum time to do hypnobirthing classes is between 28 and 32 weeks, so we were leaving it a bit late! Anyway, I got in contact with Emma, from Own Your Birth, and she was fabulous and assured me that no, we weren’t too late. She also made an extra effort to give me a call to speak to me about my concerns as to how useful hypnobirthing might be if I do end up have a caesarean, and I found her so lovely that we didn’t hesitate to book. The course we’re doing is over two full days, on consecutive Sundays. Emma holds the classes in the attic room of her house, with a maximum of three couples. It’s a really lovely, cosy experience and the other couples were so nice we felt completely at ease immediately. In fact, Emma offered to have a feel of my bump to see if baby seemed like she had turned (inconclusive; we can’t work out what’s going on in there!) and I didn’t worry at all about lifting up my top and letting her at my belly in front of the other couples. The session itself was great. We went through the principles of hypnobirthing and some scripts for relaxation, which were fabulous (I’m not sure if I drifted off at some points or was just deep in trance!) 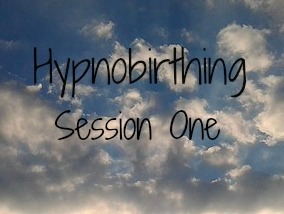 as well as watching this video which really shows how incredible hypnobirthing can be. I can’t believe that lady is actually in established labour for most of the video! She’s not one of Emma’s clients, just a lady who has posted her experience online. We left feeling completely chilled and looking forward to the next session next weekend! Have you had hypnobirthing classes? How did they help you with your birthing? Disclosure: This post is not sponsored in any way. We paid for our hypnobirthing classes ourselves and I was not asked to write this. All opinions are my own. "Book Review: Why Your Baby’s Sleep Matters"
I did hypnobirthing too! We had 5 classes that were about 3 hours each. Although my burn didn’t turn out how I had planned, in the birthing Centre in a birthing pool, I have to say that the hypnobirthing did help a little bit. Mostly the affirmations while I was having contractions, I had them up on my wall at home and then put them up in the labour ward as well! It helped to focus on something for each contraction (or surge). The deep breathing helped as well. I think in order for it to really work you need to be fully committed and do meditation every day, breathing practice every day and the birth affirmations every day. It’s kind of like trying to be a Yogi, you can’t really get there unless you do yoga all the time, you know? I’m not sure maybe it was just unlucky what happened (3 day labour). Anyway congrats and good luck! I’m hoping that even if it only helps in some small way, it’ll be worth it! Thank you for the luck! Thank you, I’m hoping it will prove useful! I think anything that makes birthing less stressful is worth a try! My mummy never tried a hypnobirthing course but went into a trace-like state when she had me and it was a very positive birth experience. She felt in control, happy and positive. As a result of switching off and becoming numb to the pain she had a waterbirth with no pain relief. Daddy thinks she’s a hippy…or a witch! Lol 😉 #BloggerClubUK Good luck! Haha! I hadn’t considered a water birth until watching that video and seeing what an amazing experience it was for that mum. Thank you for the luck!